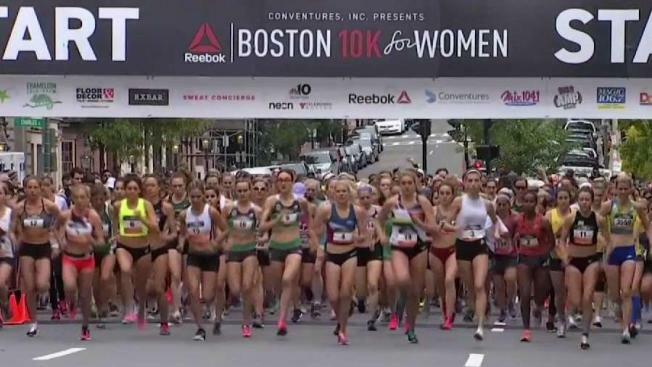 Abbey Niezgoda reports from Boston, where the 42nd annual Reebok 10K for Women took place on Monday. More than 4,000 participants flooded the streets of Boston Monday for what has become a Columbus Day tradition. The Boston 10K for Women, now sponsored by Reebok, is in its 42nd year and benefits two charities that promote fitness and wellness. Founder Dusty Rhodes said she still remembers the reaction she received when she first brought the idea of a women’s race to Boston back in 1977. “They were like what? A women’s race? Women running? Are you kidding? We’ve come a long way,” Rhodes said. It is now New England’s largest road race for women, drawing participants from all over and all generations. Shirley Jacobson, 83, of Wayland, is one of a dozen women who has been participating every year since the start. NBC10 Boston was the media sponsor of the event. The race beneficiaries chosen bring health and wellness opportunities to women and children in need. “There is Health Works, which is a gym for low income women in Dorchester and also Boks kids, which is a free physical activity program that’s in about 4,000 schools,” Kathleen Tullie, senior director of social purpose at Reebok said. Some raise money, while others raise awareness like Team Wonder Woman, made up of dozens who ran the course in capes in honor of Carol Chaoui of Wellesley. She is battling cancer for the third time and also ran with the team. “I have a mantra like I am the cure. I am the cure. It makes me feel like I’m beating my cancer each day,” Chaoui said. Emily Sisson, 26 of Providence, Rhode Island, came in first with a finishing time just over a half hour. “New England feels like home so it’s so nice racing here,” Sisson said. The first place finisher in the wheelchair division was not far behind her, but much younger. Madelyn Wilson of Spencer is only 9-years-old and said she plans to make the race her tradition.